Centuries after Brookline was established, it is easy to take for granted what makes Brookline, Brookline – from the representative Town Meeting to the layout of the roads. Sitting in the town clerk’s digital files is a database of special acts and petitions the town has accepted over the years, with some of the oldest accepted pieces of legislation dating to the 1850s. Though one of his predecessors started the archive on hard copy, Town Clerk Patrick Ward transferred it into a digital database of nearly 400 pieces of legislation. Compiled from the work of past town clerks’ and Ward’s efforts, the database contains the names of the legislation and when Brookline passed them, but it does not contain descriptions or documents with further explanation. What information is there was gleaned from old town warrants, reports and other documents in town archives, according to Ward. For Ward, who loves history, the project has been a source of great enjoyment but as his responsibilities have increased Ward has found less and less time to verify the legislation and further build the database. As such, Ward said he is hesitant to put it online, but thinks the database is still important. “It’s something I think the town should have as an archive,” Ward said. 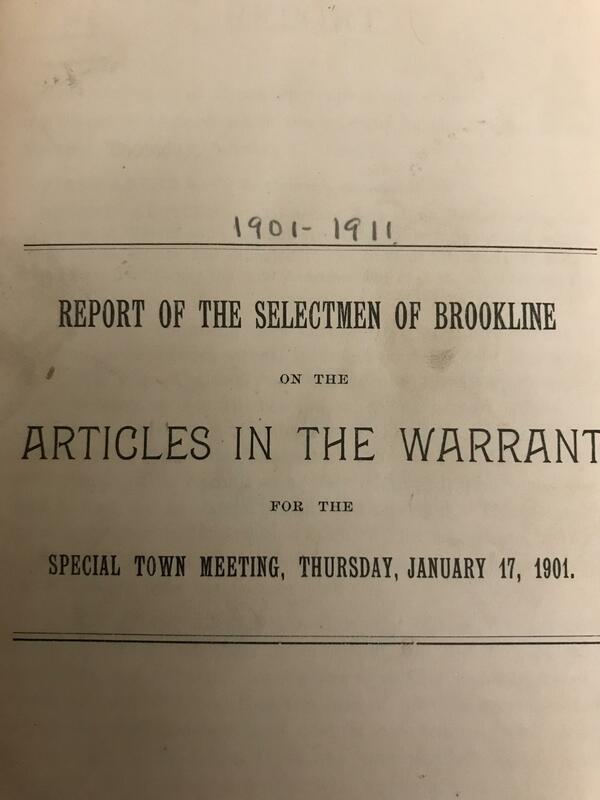 Though it is not complete, the database offers an interesting look at Brookline’s evolution, with legislation ranging from the weighing of hay, to the switch from a six- to five-day work week for town employees. “If you look back at the really historical ones, what you see has been done is infrastructure [and] planning,” said Ward. Here is a look at what Brookline officials and Town Meeting members were discussing way back when. According to Ken Liss, president of the Brookline Historical Society, the act gave the Brookline Railroad Company the right to build horse-drawn railways in parts of the town – with some restrictions. Horse-drawn railways were common in other areas around Boston, particularly Roxbury and West Roxbury. According to Liss, the goal for the Brookline Railroad Company was to build a railway to the West Roxbury Company’s line which ran near where the Green Line’s E branch runs. It is unclear if the Brookline Railroad Company ever built a line, but in the 1880s Henry Whitney – of Brookline – who owned the West End Railway, purchased other railroad companies and replaced horses with electric power, according to Liss. This act amended an 1851 act that allowed towns to use tax revenue to establish a library, according to Liss. In 1857 Brookline established its first library in the 1844 Town Hall building on Prospect Street, according to Liss. Both the building and Prospect Street are long gone. According to “The Public Library of Brookline: A History”, Brookline High School Headmaster J. Emory Hoar, was appointed as the first library director with a salary of $125 per year. According to Liss, Brookline did not have its own water supply until the 1870s. A pumping station built at Cow Bay in West Roxbury in 1875, brought water to a town reservoir on Fisher Hill across from a state-owned reservoir which is now Fisher Hill Reservoir Park. In the 1880s residential development lead to the construction of a pumping station on Newton Street which sent water to a new tank on Singletree Hill, according to Liss. Another point of interest, according to Liss, is that before meters were introduced in 1905, water rates were based on the number of faucets, bathtubs, water closets, garden hoses and animals kept by a household or business. This act loosened the Commonwealth Blue Laws – dating back to Puritan times – which prohibited the sale of ice cream, confectionary, soda water and fruit on Sundays. According to the 1910 Town Warrant, sale of these items on Sundays had become so customary the police did not enforce the law. In 1909 the state passed an act requiring businesses to obtain licenses from their municipalities in order sell the items on Sundays. According to Liss, Massachusetts Blue Laws have not been fully eliminated, but the state ban on businesses being open on Sundays was removed in 1983. As one of 15 towns and some cities in the state, Brookline was a leader in paying women teachers the same as men, according to Liss who referenced a 1944 Globe article. At the time, Brookline paid women teachers a higher maximum salary – at $3,100 per year – than those of any other town in the state.